Gordon Baldwin (born 1932) is Britain’s most distinguished living sculptural potter, an artist who has explored the hand-built vessel to investigate all kinds of two and three-dimensional ideas, as much a canvas for his quietly expressive drawing as a means of redrafting form, space and volume in clay. Born in Lincoln and trained at Lincoln School of Art, he progressed to the Central School in London, where he subsequenty became a distinguished teacher. Baldwin also taught at Eton College for almost forty years. 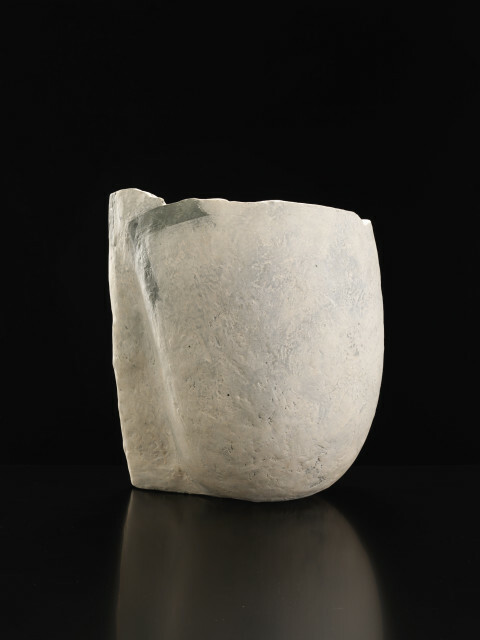 If Ewen Henderson typified the more visceral, geologically charged aspects of clay, Baldwin’s work is often more understated and distilled, though he is also capable of sculptural drama in his rich variations on the bowl and bottle and other forms. Beginning with totemic semi-figurative shapes in the the late 1950s, Baldwin’s pieces became more concentratedly abstract by the early 70s, with his concerns developed in two-dimensional work too. Baldwin now focusses on drawing on paper, marking down his thoughts and ruminations in a kind of expressive shorthand. This work is a remarkably fertile phase in his imaginative journey. He lives and works in Shropshire.